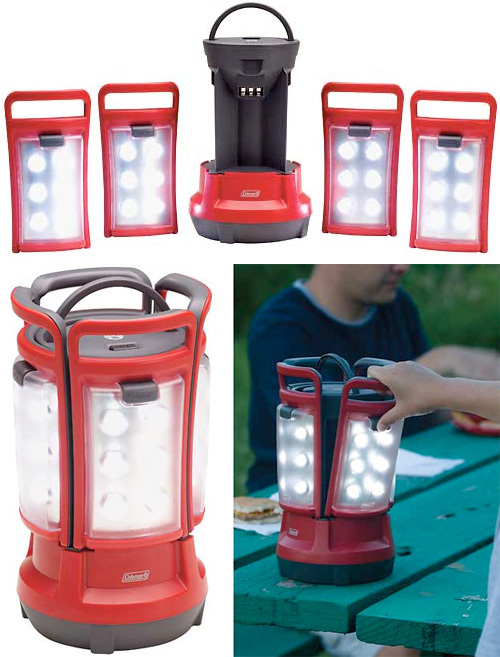 Coleman Quad Lantern For You Outdoors Types Who Like To Share | OhGizmo! By Andrew Liszewski on 10/14/10 • Leave a comment! There always seems to be one person who forgets to bring a flashlight when camping, so with the Quad Lantern from Coleman you can be an illumination philanthropist, sharing your light with up to 3 other people. The base station features 4 removable panels that each contain 6 x 5mm white LEDs, and when they’re all ‘docked’ it can be used as a single lantern thanks to a master power switch on top. Each of the panels can also be removed and used individually, and when fully charged they’ll each run for about 75 hours. The base station does require 8 x D size batteries instead of having its own built-in rechargeable power source, but when ‘roughing’ it they’re probably easier to replace when they die. $69.99 available directly from Coleman.